The recent controversies about micro-targeting voters – seemingly by stealth – have brought into focus the use of data analytics by companies, intent on more effective marketing and sales. The first duty of any company is to make a profit, but it should do so while respecting the data privacy of its customers and prospective customers. For commercial organisations, finding this ethical balance between making money from data and safeguarding the privacy of personal data is more important than ever, and the EU’s GDPR [General Data Protection Regulation has somewhat concentrated minds on this matter]. The articles in this e-zine show this balancing act is playing out. It would be foolish for any company, or organisation to blind itself to the opportunities to get closer to their customers afforded by the analysis of data. But it is potentially ruinous to be blasé about data privacy. The lead article looks at how customer analytics applications developers are seeking to add layers of intelligence to improve sellers’ interactions with buyers; at how large retailers, banks and telecoms organisations are following the lead of the likes of Google and Amazon. However, we report on how the affiliate marketing industry needs to clean up its act in terms of privacy law compliance, as revealed by a review of more than 900 websites. And we find that more than 40% of marketers feel their organisation is not ready for the upcoming changes entailed by GDPR. 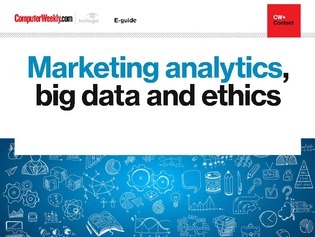 Nevertheless, predictive analytics, and other forms of analytics, can yield new marketing benefits to businesses. Sainsbury’s chief data officer has mapped out a “farm to fork” data strategy the supermarket is implementing, bringing customer and product data together in ways that “drive a raft of retail applications, such as in ranging and pricing”. Sainsbury’s has a tool set that includes Microstrategy, Microsoft Power BI and SAS – and has a strong interest in applying machine learning on top of business intelligence. Voice recognition has become a new area for understanding customers better. Here we ask what does the new voice channel mean and how will voice data integrate with existing forms of customer intelligence and marketing, and do so ethically? In this e-guide we can also find the United Arab Emirates-based Rakbank using SAS analytics software to better understand its customers following an implementation of the supplier’s anti-money laundering software. And here we see, additionally, Canadian luxury shoe retail brand Aldo using data to create a single view of its customers across all channels, and on an international scale. Balancing respect for the privacy of data subjects with capitalising on the opportunities afforded by data analytics will be a constant challenge for corporate organisations. But it is a necessary balance.